Let’s face it. Not all words were created equal. Some are just better than others. In the vast and varied lexicon that makes up the English language, words that roll off the tongue with a wet and satisfying SPLAT are few and far between. Alas, the existence of lame words only serves to make the really good ones all the more precious and worthy of celebration. Words like abominable. Sacrilege. Ephemeral. Maybe wherewithal. And one of my all-time favorite four-letter words, dump. Okay, it doesn’t exactly qualify as one of THE four-letter words, but it’s close enough for jazz (as they say). If you ask my opinion, dump has to be one of the most colorful and expressive words in the English language. Go ahead and sound it out, if it helps. Say it out loud. Few words feel as satisfying when they fly out of your pie hole. There’s the hard d, followed by the suspiciously vulgar u, capped off with a pressing together of the lips and the formation of the final mmp that – if executed properly – can send a mist of spittle from the lips. It’s totally base and beautiful. What I find even more fascinating about the word dump is that it’s got an incredible diversity of meanings, implications, and uses. Dump isn’t just a noun. It’s also a transitive and intransitive verb, and in some variations can even be used as an adjective. (I’m really not English-smart, I had to look all that up. I still have trouble discerning between transitive and intransitive verbs, and after spending a good 45 minutes reading about it online, I’m not sure I want to anymore.) But whatever. Here are some examples of the various uses of that aforementioned old fave of mine. How’s that for vocabularical versatility? 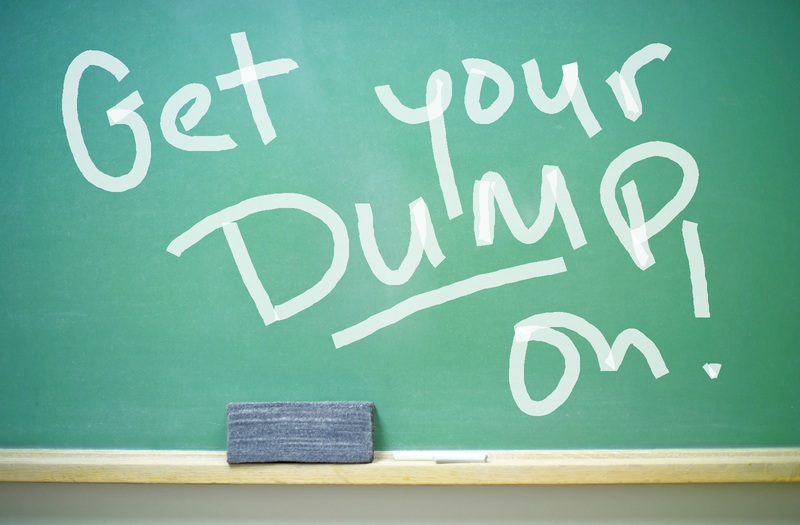 Although dump hasn’t exactly left the everyday vernacular, I do feel strongly that it’s a word strongly deserving of increased usage – and perhaps even some exploratory evolution into the realm of slang usage. So here’s my challenge to you: learn to start using dump more often. Integrate it into your daily vocabulary. Find creative uses for it. Practice it when you’re alone in the car. Wield it like a verbal sword when you’re in public. Death is certain and it could happen tomorrow. But as long as you can form words, you know you’re still alive. I’m okay with moist. I have a problem pronouncing mantle. It always comes out “mantl” but there is no way I’m going to pronounce it “man-tell” because that would be just as wrong.